This post was submitted by Liz Buchanan, originally published in her blog on March 17, 2015. In my songwriting life, I’ve become a little obsessed with characters in threes. 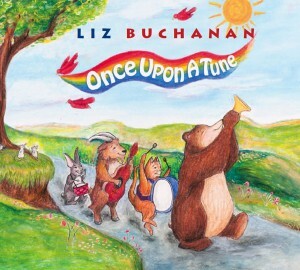 My initial “Three Piggy Opera” was so much fun that on my next album, Once Upon a Tune, I included my own songs about The Three Bears, Three Billy Goats Gruff and Three Little Kittens. You can find all these songs at my Songs for Teaching Page. What’s with all the threes? Plus there are all the variations and parodies of the above stories: The True Story of the 3 Little Pigs, The Three Little Wolves and the Big Bad Pig, Los Tres Cerditos. How about The Three Little Tamales or The Three Little Javalinas! The three-character theme is a staple of many a kindergarten curriculum. Why three? This is probably all explained similarly elsewhere, but here’s my take. The three somebodies are a perfect way to teach about the elements of the typical linear story. Stories have a beginning, middle and end. Stories have a protagonist who wants something. Stories have an antagonist who thwarts what the protagonist wants. Protagonist figures out in the end how to overcome antagonist. Hey, that’s just what they taught us when I got my MFA in fiction writing (though of course there are the feminist variations that just go in circles). What makes a good story all comes down to … The Three Little Pigs! So at my most recent kindergarten concert, I lined up three children holding their three cut-out houses, of straw, sticks and bricks. I said, “Just like these three pigs, stories have three parts: a beginning, middle and end.” The first pig is the beginning of the story, the second pig is the middle, and the third pig finally figures out how to solve the problem. The Three Billy Goats Gruff unfolds in exactly the same way. The Three Bears gets more complicated, because Goldilocks isn’t your classic bad-wolf antagonist, she’s just a bit confused about what to do upon encountering a strange house in the woods. But in a slightly more advanced way, the story’s scenes develop with essentially the same three-part structure. It also occurred to me that The Three Little Pigs is a perfect way to lay the groundwork for writing a simple, cohesive essay. You know: state your premise, develop your ideas in three tidy segments, and tie it all together in a conclusion. Now, I wouldn’t go telling kindergarteners to write essays based on the three pigs structure (though in this current weird world of ‘kindergarten is the new high school’ somebody might be trying to do that). But I do think that learning the structure of the ‘story of three’ provides an effective overlay for the logical analysis, organization and presentation of ideas. Again, I’m sure I’m not the first person to think of this. But for me, it was an aha moment. Do kids get the connection? Do they better understand literature and write more cohesive essays after carefully studying The Three Little Pigs? I don’t know. I’d love to hear from teachers on this topic. I do firmly believe that giving students a chance to embody the story through singing, moving and acting deepens their understanding and might even make them better writers. Plus they’re having a lot of fun – we can still do that in education, right?